Motivate your kiddos to learn multiplying decimals with these 'supercharged' decimal multiplication cards. Once they're done, they'll ask you for more. 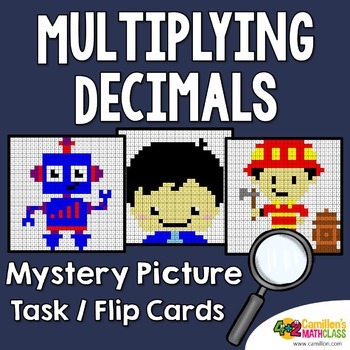 Kids love solving mysteries, and they will enjoy uncovering the mystery picture after answering all the cards in this multiplying decimals mystery picture activity. Each version has 3 sets -- with 12 cards with decimal multiplication problems, an answer/coloring sheet, and the answer key. b) Back-to-back cards with the questions in front and the choices at the back. Copyright © Marlon Dawas. All rights reserved by the author. Purchasing this product grants permission for use by one teacher in his/her class. Purchase additional licenses if you plan to share with others. Intended for classroom and personal use ONLY.